A tour bus swerved for several minutes Sunday evening, crashing into two other vehicles before flipping on a two-lane mountain road east of Los Angeles in a rollover that killed at least seven people and injured 38 others. 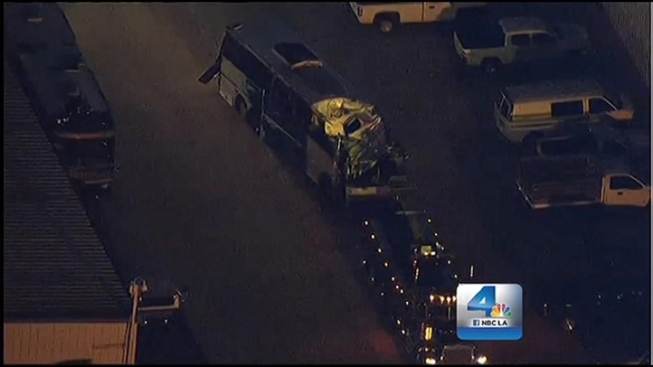 After inspecting the interior of the bus Monday afternoon, California Highway Patrol investigators revised the total numbers of victims killed to seven. Initial estimates were that eight people were killed. Shortly after 5:00 p.m. on Monday, a tow truck began hauling the bus from the scene. It was being taken to Certified Towing Incorporated in Ontario as evidence, according to CHP Sgt. Andrew Thompson. Crash investigators at the location -- on Highway 38 near Yucaipa, about 80 miles east of Los Angeles -- are attempting to determine what led to the deadly incident, which occurred at about 6:30 p.m. Sunday. Nearly 24 hours after a tour bus crashed on Highway 38 in the San Bernardino Mountains, a tow truck on Monday began hauling the bus from the scene. At least seven people were killed Sunday night when the bus lost control and began swerving down the highway. Jacob Rascon reports from the crash site near Yucaipa for the NBC4 News at 5 and 6 p.m. on February 4, 2013. "Speed was probably a factor," said CHP Officer Mario Lopez. "We do not know if there was a mechanical failure or driver error. That's what investigators at the scene are going to determine." Highway 38 reopened at about 6:20 p.m. on Monday, according to the CHP. The National Transportation Safety Board held a news conference Monday evening to say the federal agency would be working with the CHP to investigate the crash. Federal Safety records of the bus company involved in Sunday's deadly crash, Scapadas Magicas, show that it has had a somewhat troubling history. The company has caught the attention of federal regulators for its poor maintenance of its buses. An attorney specializing in low-budget bus companies says they often cut corners when it comes to safety. Joel Grover reports for the NBC4 News at 5 and 6 p.m. on February 4, 2013. The NTSB plans to review bus maintenance records, as well as the damage to the bus, investigator Robert Accetta said at the news conference. A victim's family member identified some of the passengers as medical students from Tijuana, Mexico and their guests on a "field trip." They were returning from a skiing and snowboarding daytrip to Big Bear when the bus began swerving and the driver, who survived the crash, reported a problem with the brakes. The bus collided with a Saturn sedan and Ford truck that was towing a trailer. Aerial video showed debris scattered across the two-lane road and the pickup with significant damage on the side of the road. 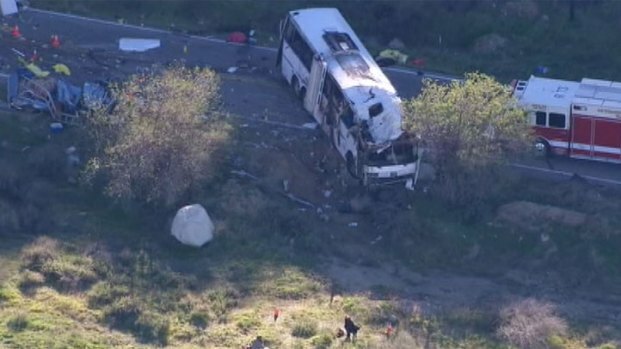 Passengers said a tour bus swerved for several minutes before a deadly crash on Highway 38 near Big Bear. The tour operator released a statement after the crash that killed at least seven people. Annette Arreola reports for Today in LA on Monday Feb. 4, 2013. The pickup driver suffered major injuries, and three people in the Saturn suffered minor injuries, according to the California Highway Patrol. Betty Harvey was traveling down Highway 38 when she saw the bus speed past. "I saw a headlight in the my rear-view mirror," said Harvey. "I moved over and he went flying past. He was swerving all the way down." 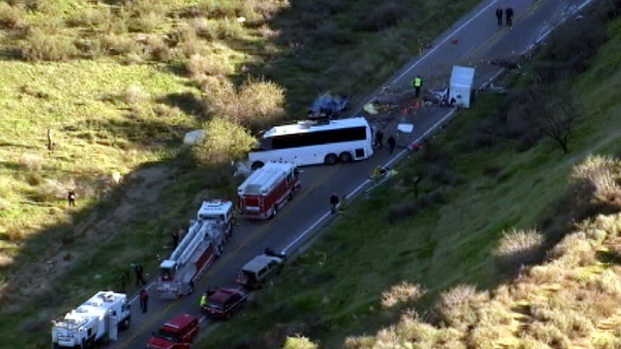 An 11-year-old girl was among the passengers critically injured in Sunday's tour bus rollover near Yucaipa. Family members say they are still trying to located her mother. Toni Guinyard reports for the NBC4 News at Noon on Monday Feb. 4, 2013. Passengers told NBC4 the bus swerved for about three minutes before it flipped near Bryant Street (map). About 40 people were aboard the bus, owned by Scapadas Magicas LLC. At least 15 victims remained hospitalized Monday morning. The San Bernardino County Coroner's Department late Monday afternoon released the names of four of the people killed in the crash. Officials with the coroner's office remained at the location Monday (AP photo embedded right). Highway 38 was expected to remain closed during the investigation Monday. Scapadas Magicas has offices in National City, Calif. Federal transportation records show that the company is licensed to carry passengers for interstate travel. No crashes involving a company owned bus have been reported in the past two years, but several violations were reported during inspections, according to federal records. The violations -- based on a 24-month period that ended Dec. 14, 2012 -- included loose wheel fasteners, power steering and brake system issues, according to the Federal Motor Carrier Safety Administration. The tour operator, INTERBUS Tours, released a statement Monday morning on its Facebook page. "INTERBUS Tours and its team are working to support our clients and their families that unfortunately suffered an accident coming down from the mountains of Big Bear in San Bernardino CA. Interbus staff are located in offices and in the hospitals where we know the authorities transferred the wounded."